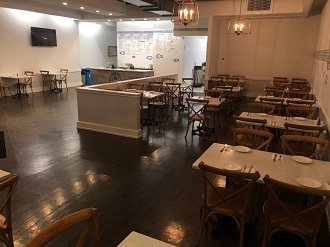 Feb. 6, 2019: OpaOpa Fresh Greek is a casual and friendly new spot in the Bronxville business district that serves classic Greek dishes in a light and bright setting. The restaurant is divided into two areas, one for dining and one for takeout. The walls are white with deep blue Greek motifs in the dining area on one wall. It is nice to have a new kind of cuisine in Bronxville, and I hope that everyone will support Faik Berisha, the owner, and his partner, Tony, who is also the chef. Faik is passionate about his fresh, never-frozen fish that is served here along with classic Greek dishes like moussaka, spinach pie, and baklava, which are all made on the premises. The extensive menu features appetizers, salads, soups, kebabs (on a stick), burgers, homemade Greek specials, souvlaki plates, and categories called "from the land" and "from the sea." My dinner started with the spinach pie, nicely flavored with lemon, which my friend and I shared. We then had the moussaka and the chicken souvlaki plate, both of which were served nice and hot with Greek salad, pita bread, tzatziki, and yummy lemon potatoes. I recommend both dishes. For dessert, we shared galaktoboureko, the most divine Greek custard pie with filo dough topping and honey. Other choices that I have tried for lunch are the lamb & beef gyro, the small-sized Greek salad with grilled chicken breast, and the avgolemono, Greek chicken, orzo, and lemon soup. Portions are very generous here, so you can definitely share. Right now, there are seven fish dishes at market price on the menu, but some of these will be taken off and prices will be shown instead of "MP." A big part of OpaOpa is the take-out business, which takes up almost half of the restaurant space. A sandwich typically takes five minutes to make, an entrée fifteen minutes, and the fish dishes need thirty minutes to complete. It is wise to call ahead if you can. Faik is offering a gyro, French fries, which I hear are very tasty, and a soda for the school children at lunch for $9.95, and he hopes that he will attract them to his restaurant. The back wall of the dining area will hold shelves to store wine when the restaurant gets its beer and wine license. Right now, you are able to bring your own wine and they will open it and provide you with wine glasses. 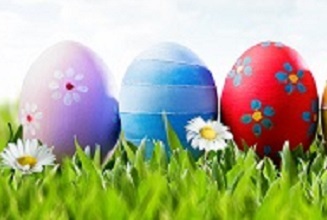 At night, the lighting is dimmed, and attractive votive candles are on the tables. OpaOpa Fresh Greek is open from 11:00 am to 9:00 pm every day. First two photos by N. Bower; third photo provided by OpaOpa.